Crisis countries in the euro area benefited from official loans with much longer maturities and lower costs relative to IMF standards. Studying the differences across the lending terms of the euro area official loans can produce novel fundamental insights on the mechanisms that endogenously link the terms of official lending with debt sustainability and market access. In this column, we present and discuss the results of a quantitative model of official assistance calibrated to Portugal. Our analysis supports the view that lengthening loan maturities and managing debt repayment flows has substantial effects on sustainability, but also unveils a significant trade-off between addressing rollover risk in the short run and raising vulnerability to fundamental risk in the long run. Official lending: What's new after the euro-area crisis? Remember the ‘shock’ when Greece eventually requested official support from the IMF? The request put an end to the presumption that advanced countries were immune to the type of debt crises that appeared to systematically affect emerging market economies and developing countries (see Reinhart and Trebesch 2016 for a historical perspective on the related IMF activities). The fact that Greece was soon followed by a number of other euro area countries interrupted the cosy relationship that European governments had long entertained with the IMF, characterised by a smooth exchange of cash flows, knowledge, soft supervision and political influence. But something else changed. While the engagement of official lenders with crisis countries initially followed IMF practice, the terms of official loans were rapidly and markedly adjusted. As a striking illustration, Table 1 shows the divergence in lending terms between the IMF and the different assistance vehicles that the euro area authorities created to intervene in Cyprus, Spain, Portugal, Ireland, and Greece. By mid-2011, the maturity of the official loans granted to Greece, Portugal, and Ireland by European institutions had doubled relative to earlier deals – rates fell between 100 and 250 basis points (bps). 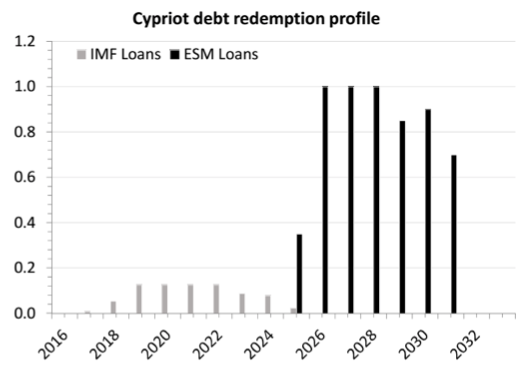 Spain and Cyprus came into the picture with loans of maturities exceeding 12.5 years. Interest rates were as low as 100 bps or below. The terms of the loans by different institutions, however, were not set independently from one another. In particular, repayments on official loans by the European Stability Mechanism (ESM) and the IMF were managed throughout the crisis to minimise the degree of overlap. 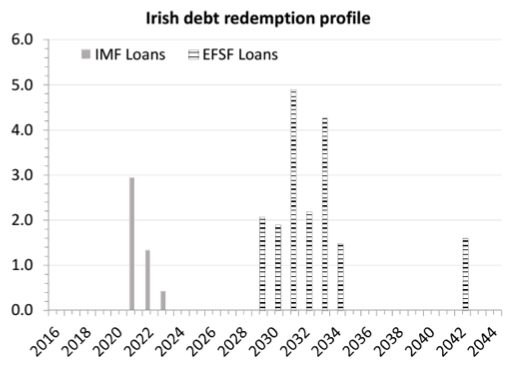 As shown in Figure 1, the official debt repayment profile was smoothed over a long time span. Note: * Refers to four-year maturity. Source: Corsetti et al. (2017) based on IMF, European Commission, European Financial Stability Facility, European Stability Mechanism and Bloomberg. Note: Debt repayments are measured in billions of euros. Source: Corsetti et al. (2017). These developments did not come without tensions. In various crucial episodes, differences between the IMF and euro area official lenders translated into open disagreement. The most controversial aspects related to the risk of financial spillovers, most notably regarding Greece’s need for debt restructuring and the bail-in of Irish banks’ bond holders, both supported by the IMF (Pisani-Ferry et al. 2016). Heavy internal criticism accompanied the IMF’s decision to modify its Exceptional Access Policy, used to deal with capital account crises, in order to participate in the euro area rescues.1 The so-called systemic exemption clause (IMF 2013) allowed the IMF to lend above normal limits even if a country failed the debt sustainability test, provided its default could have strong adverse systemic effects elsewhere. The clause was eventually revoked in 2016. These difficulties in reaching consensus reflected more than institutional and policy differences. They also highlighted unresolved issues in the approach to assess debt sustainability in a world where, due to financial globalisation and the deepening of capital markets, sovereigns seek financing in large, liquid but also reactive (and at times jittery) public bond markets. And dealing with euro area countries, their high degree of financial and real interconnectedness fed concerns of adverse spillovers and contagion effects. There is little doubt that, because of the scale of the experiment and terms of official loans, a systematic analysis of the bailouts in the euro area can provide invaluable insight for the design of sovereign bailouts. We have taken a first step in this agenda with two companion papers: a theoretical paper with a quantitative application to Portugal (Corsetti et al. 2018 ), and a policy discussion paper for which we collected a dataset containing information on the evolution of the different components of the official support provided to crisis countries (Corsetti et al. 2017 ). Our main goal was to use the euro area programmes to learn about the mechanisms that endogenously link official lending with debt sustainability and market access by using the variations in the terms of official loans (namely, maturity, costs, structure and size of the disbursements) issued to the crisis countries. What can we learn from economic theory about how official lending affects debt sustainability and the conditions at which sovereigns access capital markets? In Corsetti et al. (2018), we frame this question in a model originally developed by Conesa and Kehoe (2017). In this model, a sovereign takes expenditure and default decisions facing both liquidity crises and fundamental output risks. Because of these risks, there are two (endogenously derived) thresholds for debt: a lower one beyond which the country defaults only when facing a rollover crisis, and a higher one beyond which the country defaults for fundamental reasons, independently of any rollover crisis. When debt is below the lower threshold, countries can borrow at the risk-free rate – the country is in the ‘safe zone’. When debt is between the two thresholds, the country is in a ‘crisis zone,’ since the government repays only as long as investors coordinate on an equilibrium with debt rollover, but repudiates otherwise. Most crucially, these debt thresholds are not constant, but may vary depending on whether the economy is in a recession or in normal economic conditions. A key advantage of this model consists of clarifying the core policy trade-offs affecting a government borrowing and default policies. When in the crisis zone, because of rollover risk, the country has an incentive to reduce its debt to the safe zone, in which it is immune from liquidity runs. However, this incentive is moderated by recessions, which motivate the government to postpone adjustment and keep borrowing in anticipation of a recovery. We enrich the Conesa-Kehoe model by adding official lenders, and ask how their presence changes the trade-off just described, critically affecting debt sustainability. We focus on three main features of official loans: maturity, price, and the structure and size of the disbursements. Drawing on the euro area crisis, we allow for two baseline types of loans: one with shorter maturity and higher rates (‘IMF-style’), the other with longer maturity and lower rate (‘ESM-style’). We also model the case in which funds are made available on a front-loaded basis (like under the IMF’s Exceptional Access Policy) or in sequential tranches (as in traditional programmes). A crucial lesson from our model is that a country chooses to repay or default by factoring in the possibility of official support. The availability of long-term concessional loans affects the policy space by changing the anticipated stream and composition of contingent debt payments in the future. In some of the paths along which the economy may develop over time, official loans will be part of government liabilities, smoothing them (through longer maturities) and reducing them (if rates are below markets). In fact, this theoretical insight sheds light on an important lesson from the experience of the euro area concerning the extent to which managing the structure and time profile of debt repayment stream, for any given debt stock, can affect sustainability. We show that the path of repayment flows has first-order effects on default thresholds, as well as on the willingness of the private sector to finance countries in the crisis zone, i.e. it influences market bail-ins. Specifically, we show that the stock of ‘safe’ (default-free) debt that a country can sustain is unambiguously increasing in the maturity and the price at which a country can obtain funds from the official sector. This is because, at the margin, longer maturities reduce the amount of debt maturing in each period and thus subject to rollover risk. At the same time, lower rates (or higher bond prices) enhance the government borrowing capacity for any given default cost, raising the credible level of future payments. Moreover, we show that, for countries with debt high enough to be vulnerable to rollover risk (and thus operating in the crisis zone), access to official loans can be designed to smooth out the path of debt reduction towards the safe zone, reducing the adjustment costs along the transition. Official loans are not a free lunch, however. The most novel contribution of our analysis consists of unveiling a key policy trade-off in official lending between increasing the amount of safe debt (immune from rollover risk) and strengthening the incentive to default in response to negative shocks to fundamentals. Here is the trade-off – if official lending makes more debt sustainable, it also raises the average stock of debt in the long run. With a higher average debt level comes a larger long-run interest bill and, thus, lower long-run consumption. The incentive to default under adverse fundamental shocks becomes correspondingly stronger, as countries are tempted to default instead of meeting their higher interest bill and longer-lasting principal repayments. We should stress how this result contributes to the literature on debt sustainability. This literature typically models ‘moral hazard’ from official lending by introducing costly policy reforms and/or government effort – both are bound to be discouraged by prospective bailouts implying positive transfers. In our model, we show that, independently of these mechanisms, there is a more basic form of distortion akin to moral hazard. By making more liabilities free of rollover risk, official lending can magnify fundamental default risk. The good news is that, according to our results, official loans can be designed to minimise this problem. In its calibrated version, our model does a very good job in accounting for the debt crisis in Portugal, a country which, shortly after gaining access to loans from the IMF and European institutions, experienced a drop in spreads despite a rising level of debt, and regained access to market financing shortly thereafter. Using the quantitative model, we show that depending on the debt composition, the terms of official lending and macroeconomic conditions, sustainable debt levels in Portugal can be as low as 50% and as high as 180%. 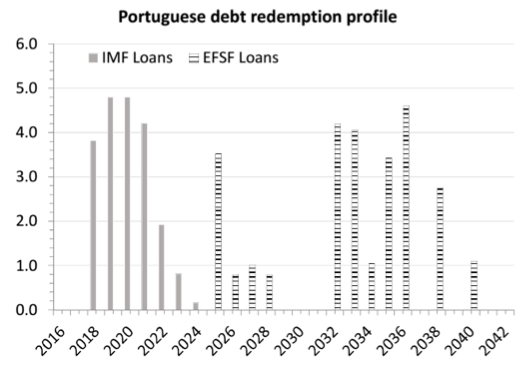 In a recession, for example, access to an official package of the size granted to Portugal may raise the stock of ‘safe’ debt by 10 percentage points, from 80% to 90% of GDP. Furthermore, not all official lending is the same; nor are different ‘levers’ equally effective in affecting sustainability. Using our model to perform ‘counterfactual analysis’, we are able to scratch the surface of an important issue, namely, how to choose the right combination of maturities and rates. In our simulations, longer maturities are more effective in eliciting private market participation and/or preserving market access than lower rates. The intuition behind this result is that while rates are bounded by zero from below, there is no technical bound to the extent by which, in principle, maturities can be lengthened. During the euro area crisis, the management of official loan maturities emerged as one of the critical items in the discussion on which instruments and strategies are most effective at ensuring debt sustainability. As we show in our analysis, this is not only because lengthening maturities can be an effective way to reduce liquidity and rollover risk, and enhance the ability of the official lender to space and manage payment flows. More profoundly, maturities can be structured to help a government pursue an optimal pace of debt reduction and improve the trade-offs inherent in raising the stock of ‘safe’’ debt. Indeed, a key message from our model is that lending policies that make more debt free of rollover risk may end up magnifying fundamental default risk in the economy. These results provide valuable inputs to the current debate regarding how to improve programme design and debt sustainability analyses. As noted by Weder di Mauro and Schumacher (2015) and Zettelmeyer et al. (2017), as long as the analysis of debt sustainability relies on models that fail to take into full account the role of repayment flows for sustainability and market access, results will be incomplete and potentially misleading (see also Gabriele et al. 2017 or IMF 2013). Sustainability assessments need to rebalance attention away from models structured around debt stock dynamics, and develop approaches that recognise the complex endogenous links between public and private repayment profiles, policy reforms, and market access. By the same token, our analysis underscores different ways in which the approach taken by the official sector may enhance the extent of bail-in by private creditors (that is, the degree to which the country maintains market access). Current discussions on how to revamp the ESM lending toolkit, including the setup and design of precautionary and unconditional loans, could benefit from incorporating these insights. These are high-priority avenues for research. Much can be gained by better integrating insights coming from quantitative models into the policy debate on how to strengthen the resilience of financial and economic systems, at both global and regional levels. Authors’ note: The views herein are the authors’ and do not reflect those of The European Stability Mechanism or any of the institutions with which they are affiliated. The working paper on which this column is based is part of the ADEMU project, ”A Dynamic Economic and Monetary Union”, funded by the European Union’s Horizon 2020 Programme. Conesa, J and T Kehoe (2017), “Gambling for redemption and self-fulfilling debt crises”, Economic Theory 64(4): 707–740. Corsetti, G, A Erce and T Uy (2017), “Official sector lending strategies during the euro area crisis ”, CEPR Discussion Paper 12228. Corsetti, G, A Erce and T Uy (2018), “Debt sustainability and the terms of official support ”, CEPR Discussion Paper 13292. Gabriele, C, A Erce, M Athanasopoulou and J Rojas (2017), “Debt stocks meet gross financing needs: A flow perspective into sustainability”, ESM working paper 24. IMF (2013), “Staff guidance note for public debt sustainability analysis in market access countries”, 9 May 2013. Pisani-Ferry, J, A Sapir and G Wolff (2016), “EU-IMF assistance to euro area countries: An early assessment”, Bruegel Blueprint 19. Reinhart, C and C Trebesch (2016), “The International Monetary Fund: 70 years of reinvention”, Journal of Economic Perspectives 30(1): 3–28. Weder di Mauro, B and J Schumacher (2015), “Greek debt sustainability and official crisis lending”, Brookings Papers on Economic Activity, Fall. 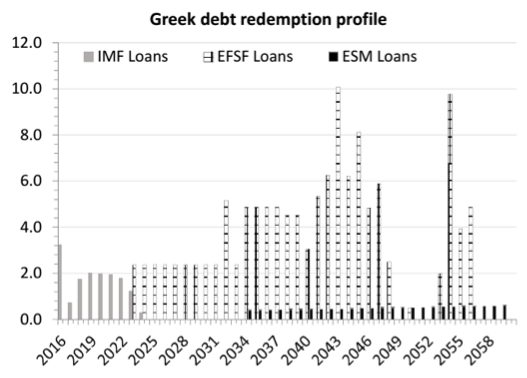 Zettelmeyer, J, E Kreplin and U Panizza (2017), “Does Greece need more official debt relief? If so, how much?”, Peterson Institute for International Economics working paper 17-6. In the process of financial globalisation, countries became increasingly exposed to external financing shocks (usually referred to as sudden stops of capital flows), rather than to traditional trade balance-related problems. In 2002, in the aftermath of the Asian crisis, the IMF approved the Exceptional Access Policy, setting the criteria countries were to meet to gain upfront access to an exceptional amount of Fund resources.